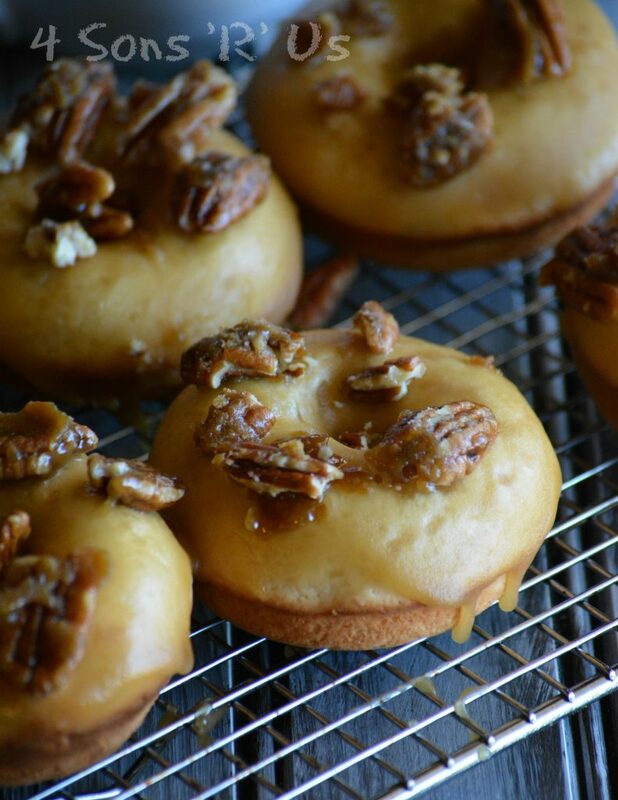 A secret ingredient is the key to these quick and easy Baked Pecan Praline Donuts. Cinnamon, honey and vanilla flavored baked donuts are topped with a sweet cream glaze for an amazing treat. Sprinkle on some candied pecans for the piece de resistance. Add a little bit of happiness to your morning, noon, or night with this yummy snack. As a busy Mom of 4, coffee is my lifeline most days. It’s also my guilty pleasure since it’s often like drinking dessert. A dessert no one else knows about thanks to my secret ingredient, which means a dessert I don’t have to share. That alone is priceless. Savoring that moment in the few minutes after I’ve brewed my cup before the kids start stirring banging around the house, is the key to a great morning. I was plagued by two problems though. cheaper for us to buy it in bulk. We’re seriously limited in flavor options in larger sizes though. So I end up spending more because I’m just too tempted by the many flavors in smaller sizes. With three flavors in the NEW 1/2 gallon size: International Delight® French Vanilla, International Delight® Caramel Macchiato, and International Delight® Cold Stone Creamery™ Sweet Cream– we’ve finally got options! Yummy, yummy options, too!! The second problem we’d always run into was the packaging. Traditionally half gallon sizes come in a carton. Cold cartons from the fridge are known to form condensation quickly when in the presence of a hot cup of coffee. If you don’t have the misfortune of knowing what an awful way to start your day is, I’ll tell you. There is no worse thing for a coffee lovin’ adult to start their day than to feel that carton start to slip from your fingers just as you’ve poured the perfect amount of creamer into your cup. Spilling creamer all over the counter before you can even see clearly in the morning is reason enough to cry. That scalding coffee running over your feet is just adding insult to injury. Thankfully someone at International Delight solved this problem by adding an easy grip/pour element to their gorgeous new packaging. It’s easy to sneak that special little moment into your morning. What if I could show you a way to sneak it into your day too? Breakfast, snack time, even dessert. Did you know that you can substitue coffee creamer for milk and cream in many of your baking recipes? Just think of all the potential flavor profiles that opens up! 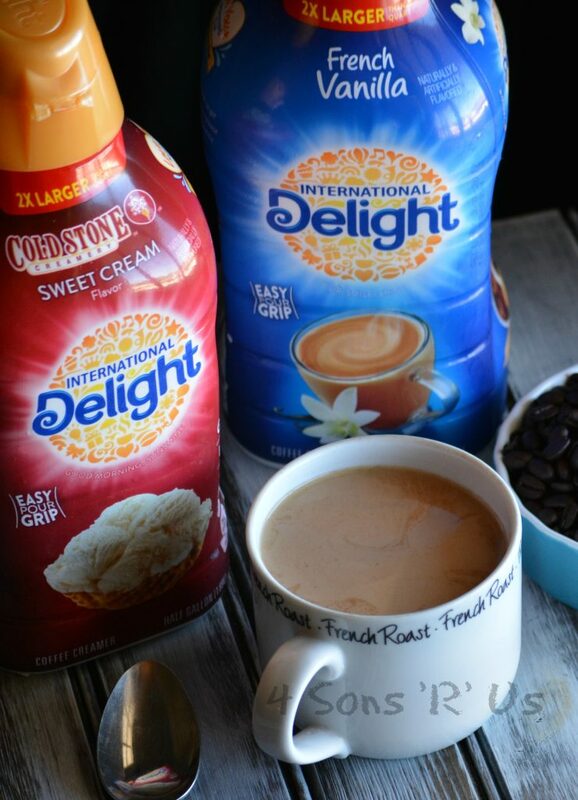 As a matter of fact International Delight® coffee creamer is the secret ingredient in one of our favorite treats- donuts! With this versatile creamer, you can handle your morning and handle your day like a boss. Including churning out a sweet treat the whole family can enjoy, all while you just smile over your coffee cup at what a genius in the kitchen you are. 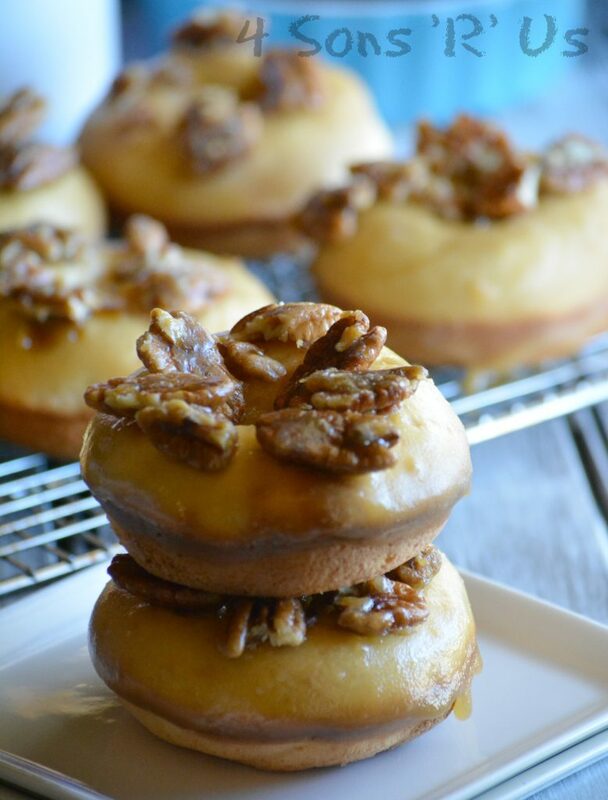 Ready in under 30 minutes- these Baked Pecan Praline Donuts are totally do-able, even on the busiest day. 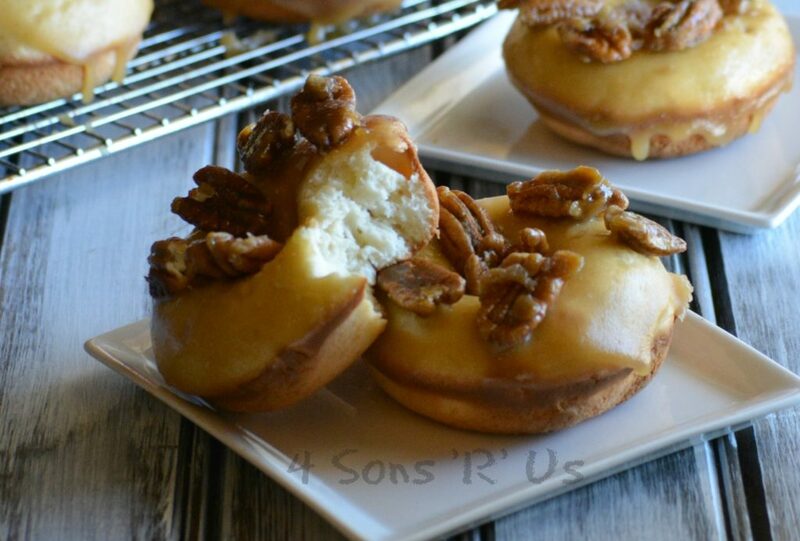 Cinnamon and sugar donuts are filled with hints of honey and vanilla, topped with a sweet cream glaze and sprinkled with warm (5 minute) candied pecans before serving. They pair perfectly with your morning cup of joe, and the whole family loves them for breakfast or dessert. Dunk them for a truly great experience– into coffee for you, milk for the kids. 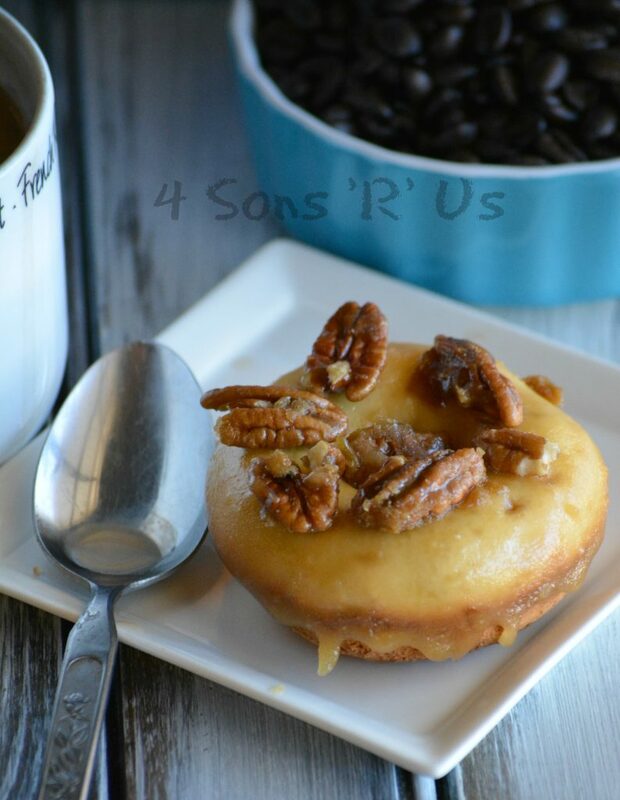 A yummy baked donut that's topped with an easy sweet cream glaze and candied pecans. Heat a medium-sized skillet over medium heat. Add in and whisk the butter and brown sugar together until they're melted together. Allow the mixture to simmer for 2-3 minutes, stirring occasionally. Remove the skillet from heat. Add in the pecans, tossing to evenly coat. Turn them out onto a sheet of parchment paper, spread them out, and allow them to harden as they cool. Add all of the 'dry' ingredients to the bowl of a stand mixer. Use a fork to stir them all together until evenly incorporated. Add in all the wet ingredients and mix on low speed until everything's come together and the batter is smooth. Prepare a donut pan by spraying it with non stick spray and then pipe the batter into the wells, stopping just below the top. Bake the donuts at 400 degrees for 10 minutes. Remove the donut pan from the oven and let the donuts rest/cool for a minute or two. Pop the still warm donuts out of the pan and transfer them to a wire rack to finish cooling. Heat a medium-sized skillet over medium heat. Add in the butter and brown sugar, stirring until they're both melted and the mixture's smooth. Reduce the heat to low and stir in the creamer and honey. Allow the glaze to gently simmer for 5-6 minutes, stirring constantly. Turn off the heat, and immediately stir in the vanilla and powdered sugar, whisking until all lumps are gone and the mixture's once again smooth. The glaze will harden as it cools. Working with one at a time, quickly dip the tops of each donut into the glaze and immediately sprinkle with candied pecans. Return the glazed donuts to the wire racks while the glaze cools completely. Serve immediately, or store them in airtight tupperware for up to 48 hours before enjoying. Head on over to the refrigerated section of your local Walmart to find your favorite flavor in it’s new larger, easier to handle form. I couldn’t agree more, Carolyn!! Julianna I kick myself every time I make them for waiting so long! They couldn’t be any easier. pecan praline is my very favorite! This look so good! They are making my mouth water right now! These look fantastic! 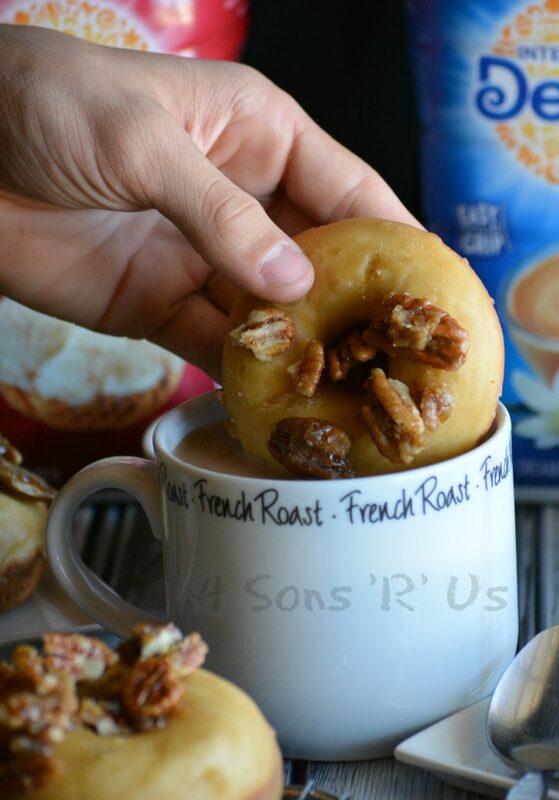 I’ve never seen pecans on donuts (I don’t get out much lol) but I think it’s a splendid idea! It’s the best idea, a match made in confectioner’s heaven! oh wow, I love International Delight.. and those donuts.. amazing!! yum! The two go hand-in-hand together! You went and did what, now? Yowsa, that is sure tempting! I love International Delight! 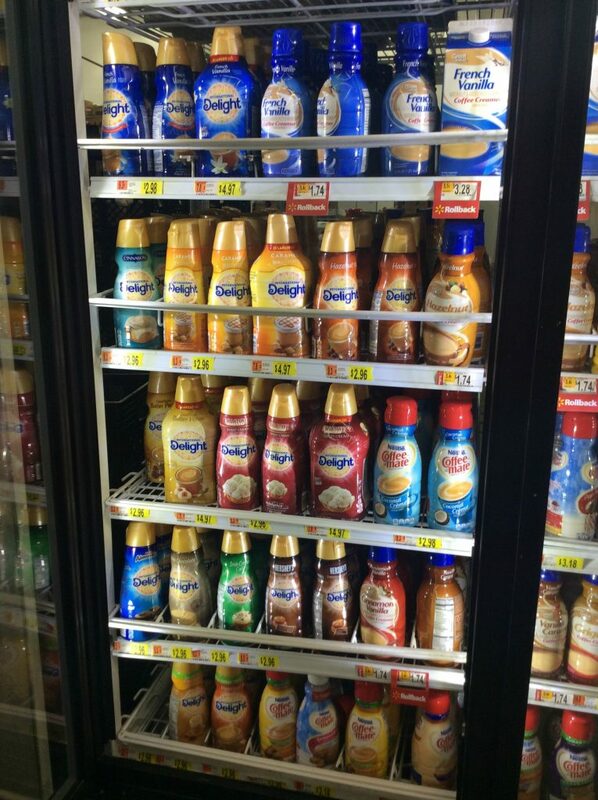 Almond Joy is my #1 creamer of choice! That’s a great choice for sure! And the baking possibilities…. Wow! I love donuts, but with pecans on top? Amazing! These donuts look absolutely scrumptious and I love that you were able to use your coffee creamer for the glaze. So yummy and convenient! These look like heaven! Pinned!